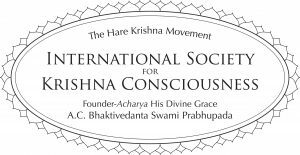 The International Society for Krishna Consciousness is based on the principles of chanting the Hare Krishna mantra, sankirtana, and distributing sanctified food, prasad (annadhan). Simply by the liberal distribution of prasad and sankirtana, the whole world can become peaceful and prosperous. Annadhan is the distribution of spiritually sanctified food, prasad, to people in general and to people in need. Because it is food which is offered first to Lord Krishna, it is considered spiritual and sacred, and grants more benefit than simply satisfying one’s hunger. One may take prasad himself, but if he distributes it or helps it to be distributed, the benefits are multiplied hundreds of times. This important charity is recommended in the Vedas for people at any time of life. It purifies the individual of reactions to sinful activities that were knowingly or unknowingly performed, and grants eternal benefits. 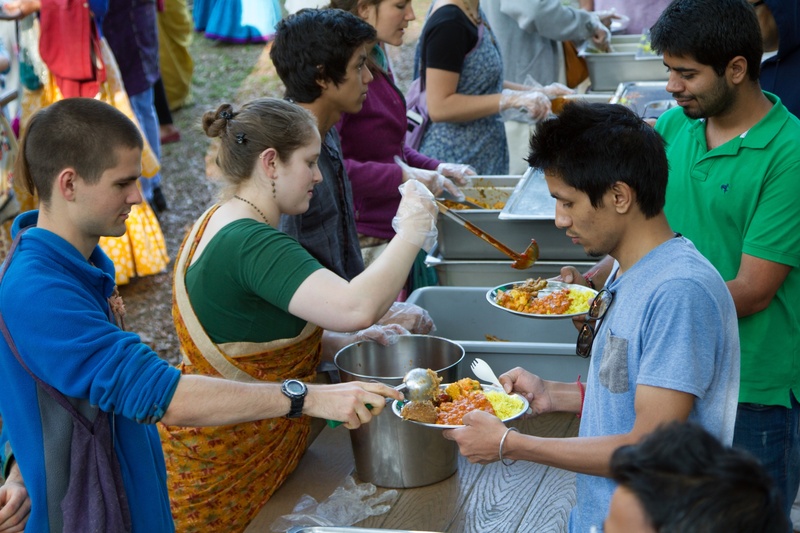 The Alachua Hare Krishna Temple has been distributing sanctified food to the public for 37 years. Our modern commercial kitchen feeds thousands of people on festival days. 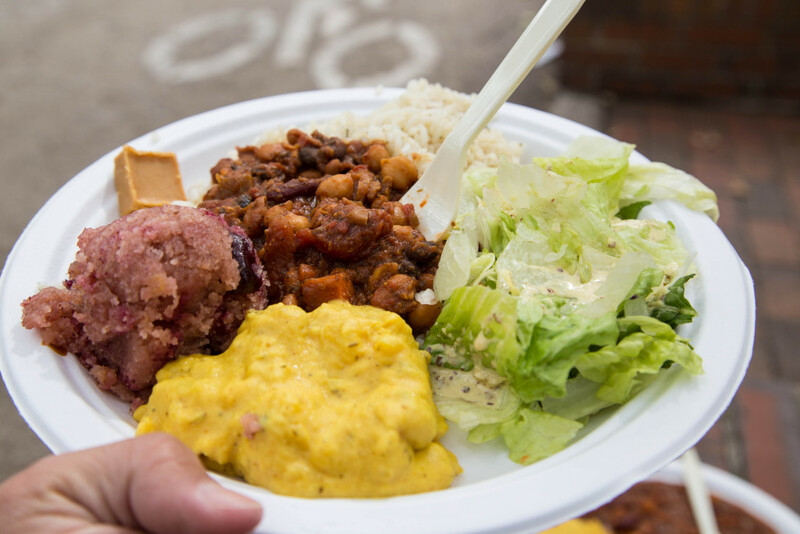 Each month we feed 2500 people at weekly Sunday open house programs where visitors, devotees and the general public eat prasad with us. During the week, at the Santa Fe College campus, we distribute more than 700 Krishna-prasad meals to students. We also distribute prasad meals to the homeless and to shut-in people in our local area. We are very happy to provide this service in our community. Your support will allow us to expand this important program and feed more people. 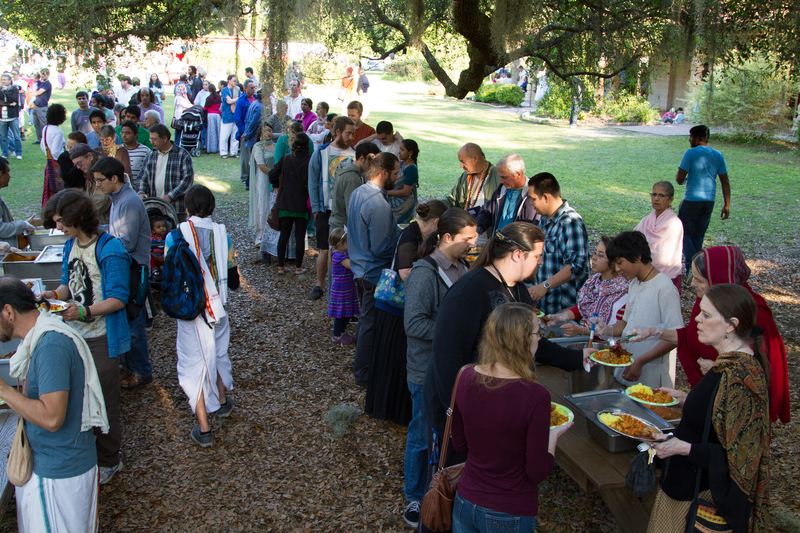 Every Sunday at 4:15pm the Alachua Hare Krishna Temple holds a celebratory Sunday Feast Program. This tradition was started in 1966 by Srila Prabhupada and has been held consistently every Sunday in many Hare Krishna temples throughout the world. Come experience a joyful kirtana (congregational chanting), an inspiring lecture on the Bhagavad Gita, a traditional Vedic arati ceremony, and a complementary six-course vegetarian feast. 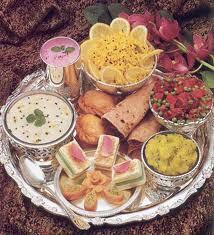 In Vedic culture it is very auspicious to serve prasadam(sanctified vegetarian food) to others. Take this opportunity to meet like-minded people, learn more about the Hare Krishna movement, and speak to devotees. 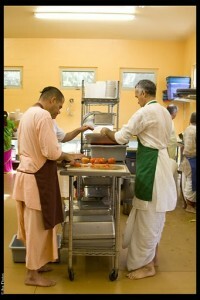 The Hare Krishna movement has been dubbed the “kitchen religion”. We are famous for our sumptuous vegetarian food. In the process of bhakti-yoga, however, devotion goes beyond simple vegetarianism – and food becomes a method of spiritual progress. In the Krishna temples, food is offered to the Deities in a special sacrament, after which it becomes prasad or prasadam. This means the mercy of the Lord. 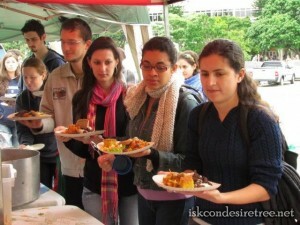 Thus, the food we eat after it is offered to the Lord becomes a means for our purification and spiritual development . We serve delicious hot and fresh vegetarian lunch at Santa Fe College, 3000 NW 83rd St., Gainesville, Florida Monday through Friday. You’ll find us set up by the Book Store in front of the S Building 11:00 a.m. until 1:00 p. m. We serve food prepared with love, that nourishes body, mind, and spirit. Our inspired cooks use the freshest ingredients and serve it on environmentally friendly plates, cups, and utensils. We started this program in January 2009 and it has been a great success ever since. Cost: The meals are subsidized and cost only $4 suggested donation payable by cash or credit card. We serve Fruity Herbal Iced Tea or juice everyday! We invite you to please take a moment and consider how you would like to help and share Krishna’s blessings. Big or small, every donation is deeply appreciated and helps to feed more people. Here are some suggested opportunities. Annadhan can be performed on any auspicious occasion such as festivals, birthdays, weddings, or in memory of your loved ones. We are always available to cater your parties, weddings and gatherings of any size. 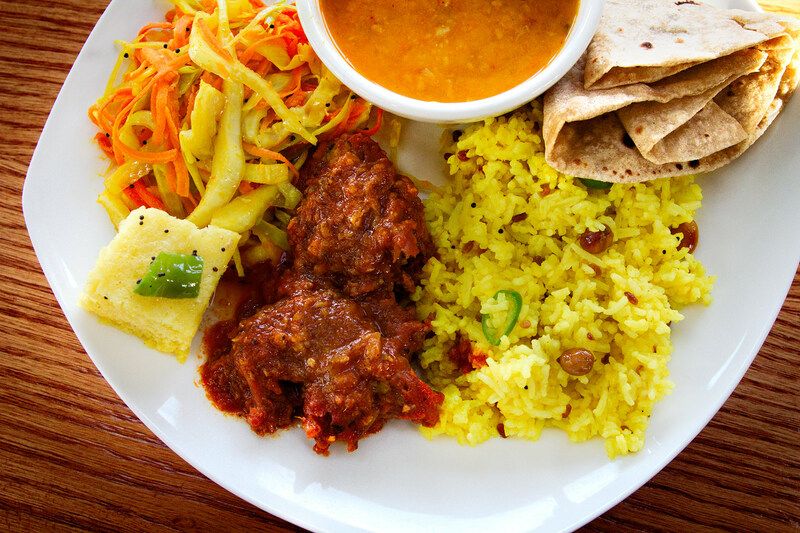 Our experienced vegetarian cooks can prepare a large variety of dishes from many cuisines. Have your party at the Temple on our beautifully landscaped grounds, under the large outdoor pavilion. For packages and price quotes and all other questions please call our temple office at 386-462-2017 or email us at alachuatemple@gmail.com and ask for Mukhya for details. Here are some of the frequently requested entries. * All food items are made with pure vegetarian ingredients, without the use of onion, garlic or mushrooms. Vegan options are always available.